Outgoing Sen. Jeff Flake (R-AZ) is not going to leave quietly into the night. He’s continuing his role as the GOP’s biggest pain in the a** by declaring he will block further judicial nominations until the Senate brings up legislation to protect Special Counsel Robert Mueller. With Jeff Sessions being fired as attorney general, Matt Whitaker has become the acting chief at the Justice Department. Whitaker has slammed the Mueller probe, which is looking into whether the Trump campaign colluded with the Russians during the 2016 election, and has declared he has no intention of recusing himself. He’s in a position to oversee the investigation, which has given congressional Democrats an ample amount of heartburn. Sen. Jeff Flake (R-Ariz.) said on Wednesday that he will oppose any of President Trump's judicial nominations until legislation protecting special counsel Robert Mueller gets a vote. "I have informed the majority leader I will not vote to advance any of the 21 judicial nominees pending in the Judiciary Committee or vote to confirm the 32 judges awaiting confirmation on the Senate floor until ... [the bill] is brought to the full Senate for a vote," Flake said from the Senate floor. Flake's threat will block the Judiciary Committee from approving judicial nominations and sending them to the full Senate without help from Democrats. Republicans hold a 11-10 majority on the panel and many of the most controversial nominees pass along party lines, meaning they would need either Flake's vote or a Democratic senator to flip. On the Senate floor, Majority Leader Mitch McConnell (R-Ky.) has slightly more leeway. With a 51-49 majority, Flake would need a Republican colleague to join him and every Democrat to block a judicial nominee on the Senate floor. NEW: @JeffFlake says he will not vote to advance any of of the 21 judicial nominees pending in the judicial committee, or vote to confirm the 32 judges awaiting confirmation on the Senate floor until the Mueller protection bill is brought up for a full vote on the Senate floor. 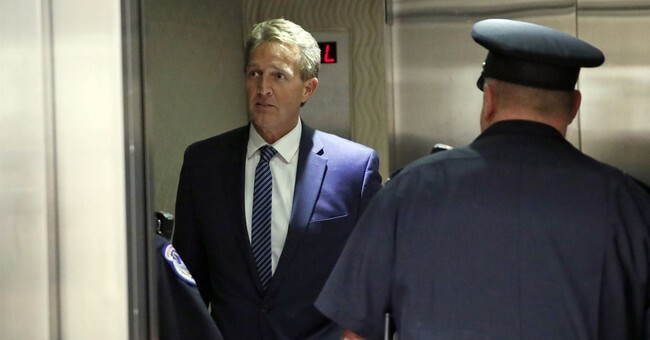 Flake had threatened to hold up judicial nominees in June as bargaining chips in the debate over Trump’s position of tariffs and travel restrictions to Cuba. This man can't leave Washington soon enough.